If you like to see the bleeding edge of fiction, check out the work of Johnny B. Truant, Sean Platt and David Wright. These guys host the Self-Publishing Podcast and write a lot of books. They follow a serial format—think of a TV series for books. They release individual episodes, collected into a season that makes up each series. And they’ve done a ton of different series. Platt and Wright have the successful Yesterday’s Gone series, Truant wrote Fat Vampire and Platt and Truant wrote Unicorn Western. Now I don’t think these guys are perfect. They’re on the bleeding edge, and I think it shows. Yesterday’s Gone is weird. The setup is so bizarre I didn’t get past the first season, but the suspense was pretty great. Fat Vampire is a hilarious concept and I liked the first one, but the sequels fell flat. Unicorn Western is another great concept, but I wasn’t hooked. That’s just my opinion though. Yesterday’s Gone has nearly 700 reviews on Amazon averaging 4.5 stars. And these guys crank stuff out. Yesterday’s Gone has four seasons out and Unicorn Western has something like nine, and it only started in early 2013. Now these guys are taking the experiment further and trying to write, edit and publish a novel in 30 days. It’s National Novel Writing Month on steroids. They’re also offering to share the process with the world, thanks to their Fiction Unboxed Kickstarter project. They’ve got all kinds of rewards (including a free copy of the Scrivener writing software that I highly recommend), but the main idea is that you can see nuts and bolts of how they crank out stories so quickly. It’s kind of a cool concept. Plus, the project has already met its goal, so it’s going to happen. If you want to support it, jump on board and reap the rewards. I’m not in love with everything these guys crank out, but they’re out there and doing it. That’s impressive. And it’s worth watching. I’ve never been big on digital reading, but I might be converting. My experience with digital reading usually involves borrowing my wife’s iPad. That’s problematic because it’s hers so she gets dibs. That makes it hard to read a book whenever I have an idle moment (yes, one of the many lessons in my how to read more book). I did read the entire Hunger Games series on her iPad, but in general I don’t like having to share the device. Then last week I noticed the book Fat Vampire by Johnny B. Truant was free for the Kindle, so I grabbed it. This was potentially problematic because I wasn’t sure how to get the book from my account on my iPhone to my wife’s account on her iPad (I don’t even know if it’s possible or not—I imagine there’s a way, but this just shows you how little I’ve experimented with digital books). I never considered just reading it on my iPhone, but the prospect of figuring out how to transfer the book and having to share my wife’s device made me give it a try. So I read Fat Vampire on my iPhone. Good book. And I loved the reading experience. I thought the small screen would be irritating. I thought flipping pages more often would get old. I thought having so many other distractions on my iPhone would pull me away from the book. Nope, nope and nope. The screen displayed the right amount of text and a comfortable size. Flipping pages more often was no big deal. If anything, having less text visible at a time made it faster to read because I didn’t keep losing my place when there were a lot of distractions. I also found it super convenient to have a book in my pocket. I take my phone everywhere, so I had a book everywhere (another lesson from 137 Books in One Year). I’m curious how it would go reading a longer book. Fat Vampire was pretty short and that seemed to help. I might yearn for the printed page with a longer book. My only real complaint with digital reading is not having an immediate sense of how much of the book I have to go. There’s a progress bar that shows your percent read, but you don’t always see that. A physical book you can just feel how much you have to go. I like the reality of a printed book, especially that it’s easy to share and it retains value. But the experience itself is just as good, if not better for some things. So I might be doing more digital reading now. I guess iPhone reading shouldn’t come as a surprise. 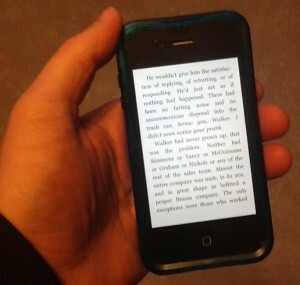 According to Jim Kukral, 62% of people said they’d read a book on their iPhone. OK, I know you’re wondering: Fat Vampire? I first heard about the book when researching how to create Kindle books and came across Truant’s post about taking only 29 days to go from idea to Kindle publication. That’s impressive, but it’s not enough to get me to read your book. What got me to read his book was the idea: If vampires never grow old and always heal, then what if a fat person is turned into a vampire? Will they always be fat? Fat Vampire turns the normal vampire story upside down by exploring this funny angle. The 29 days thing is cool, but the idea sold the book.